There’s chicken soup, and there’s sup ayam. 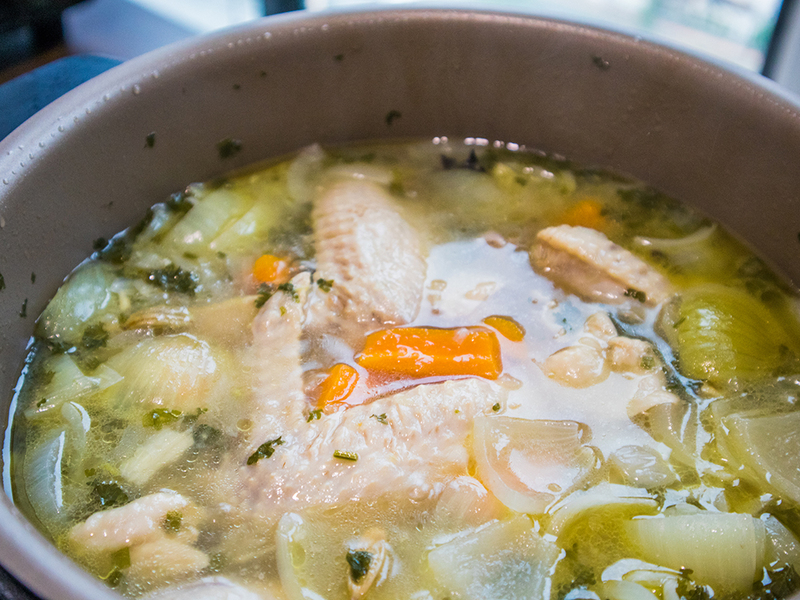 While the simpler, Western style chicken soup is comforting and enjoyed by many, nothing beats the spice-infused brew of a Malaysian style chicken soup if you’re a true blue local. 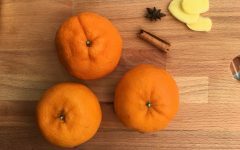 There’s something about the addition of cinnamon sticks, cloves, star anise and lemongrass that brings an extra level of comfort to Asian tummies. 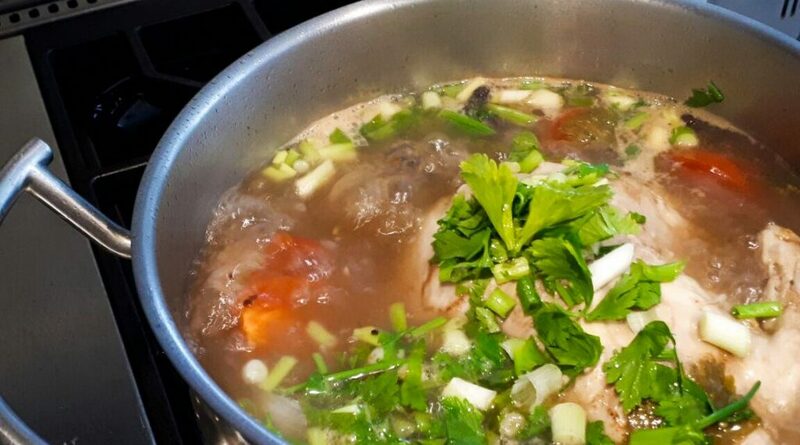 Malaysian style chicken soup is not all that difficult to make, but it does require an hour or two over the pot, ensuring your chicken cooks perfectly and the flavour is infused into the soup. 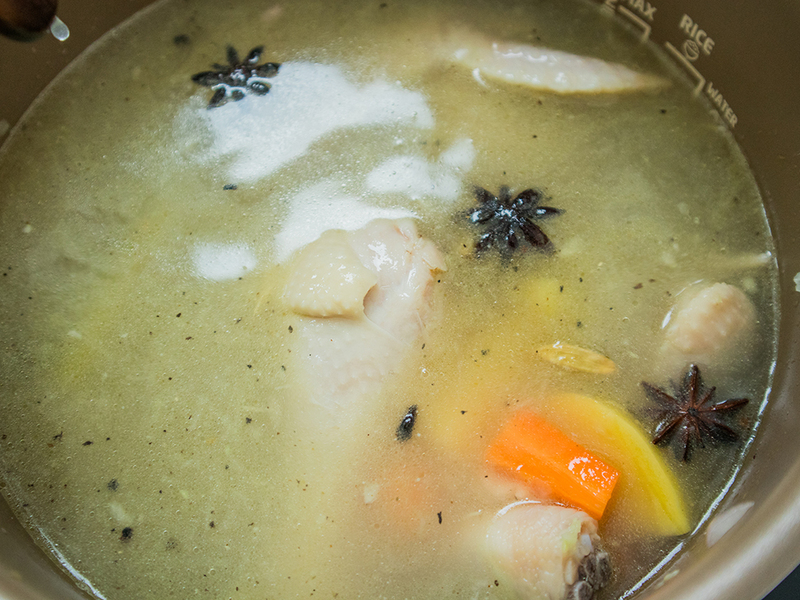 Enter slow cooker chicken soup, or slow cooker sup ayam if you prefer to keep it real. 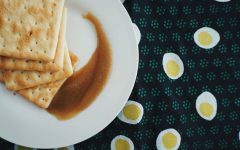 This genius invention makes cooking so easy that all you need to do is dump everything into the slow cooker in the morning, head to work, and come home to a perfectly cooked meal! 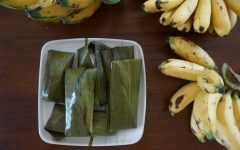 And if you’d like to have this in the morning, or even for sahur, prepare your dish at night for a delicious meal early in the morning. Ok, we admit, there a few steps of preparation involved before you can seal the slow cooker nice and tight, like frying the spices to release their aroma. 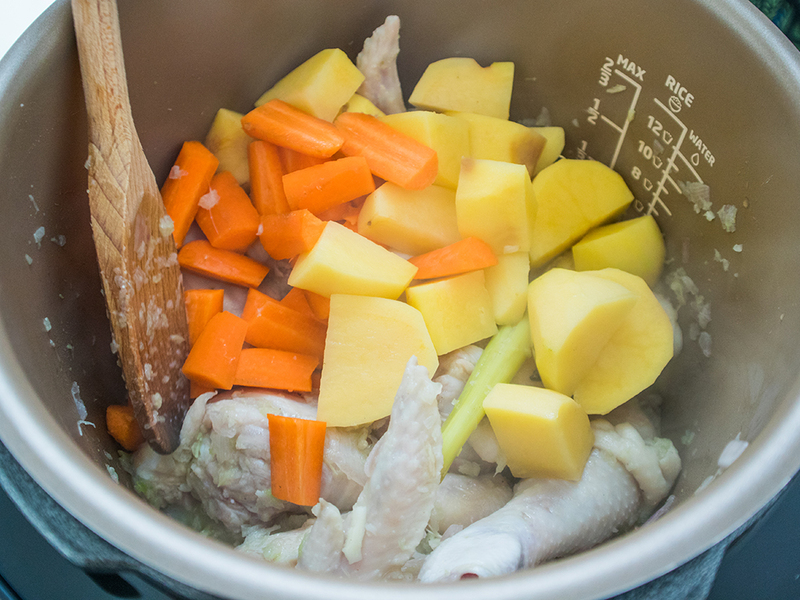 However, this won’t take very long and will make the world of difference to your slow cooker chicken soup. And the aroma that welcomes you as dish cooks… mmm… comforting and divine! Our tummies are rumbling and we can’t wait to tuck into a hearty bowl of slow cooker sup ayam. It’s best served with rice, nasi impit, or some crusty bread. 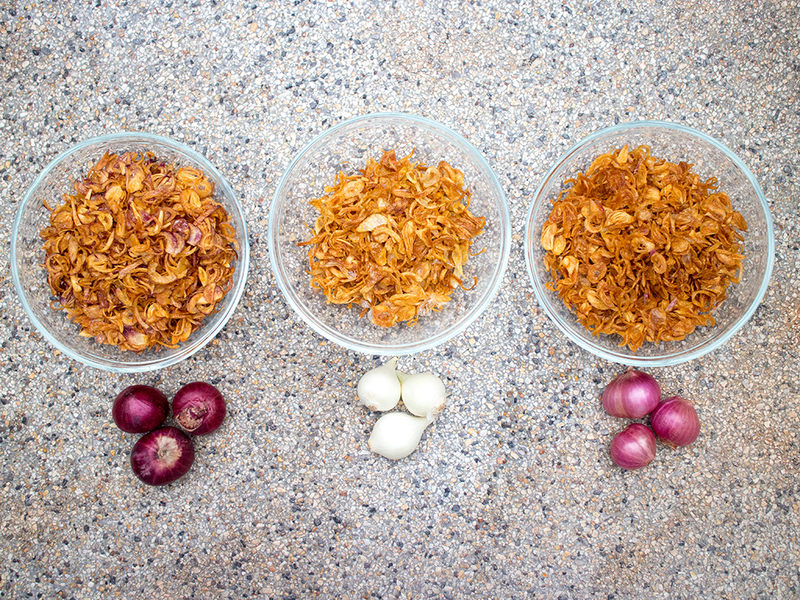 Roughly blend garlic, ginger and shallots to a medium-coarse consistency. You want them crushed, but not fine. Transfer to a bowl and set aside. Next, blend celery until smooth. Use a little bit of water to aid in this process if necessary. Set aside. Using a pestle or the flat part of a large knife, bash lemongrass on a chopping board or solid surface until it splinters. In a slow cooker, heat oil on the sauté/sear high temperature setting. Once the oil is hot enough, add in all spices and prepared aromatics except for the celery. Fry until fragrant for about 2 to 3 minutes. Next, add the blended celery and let it cook for an additional 2 to 3 minutes, stirring occasionally. This smells so good already! 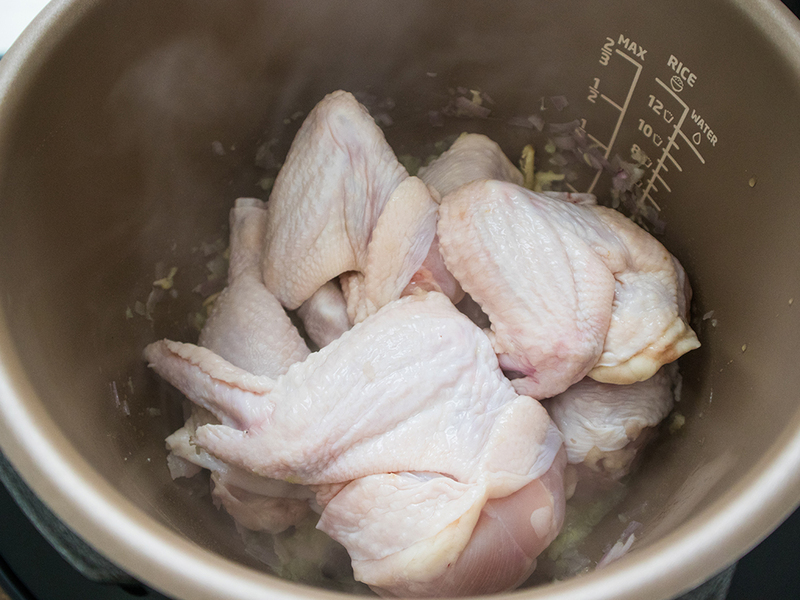 Add chicken pieces to the slow cooker and cook for about 5 minutes, just to par cook the chicken. 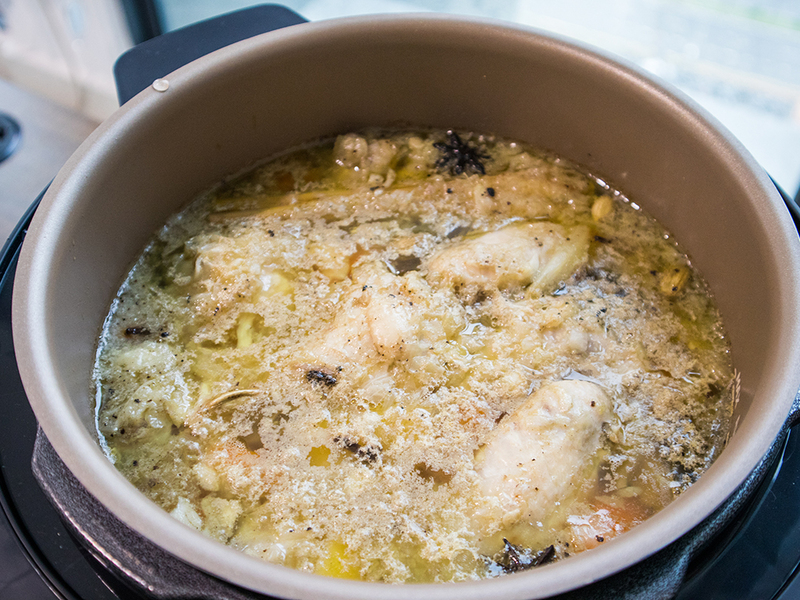 Rotate the chicken pieces so all sides are evenly par cooked. Important tip: We used a cooker which comes with a nifty sauté/sear setting. However, if your slow cooker doesn’t have this option, prepare steps 4 to 6 on your stove top using a wok or pot on high temperature. 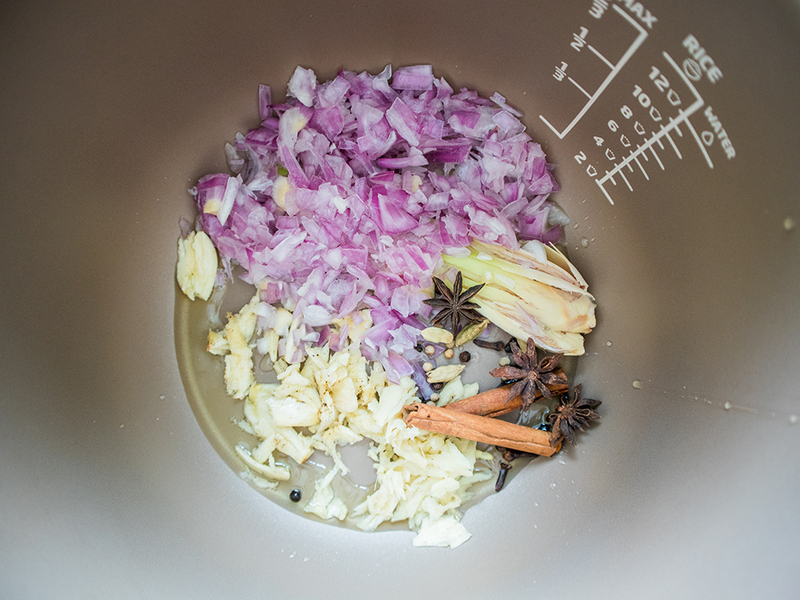 Then, transfer all the ingredients – spices, oil, chicken and all – into the slow cooker. 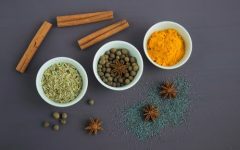 Do not skip this step as frying the spices and aromatics is integral for making really good sup ayam. Add carrots and potatoes next, followed by water, salt and pepper. 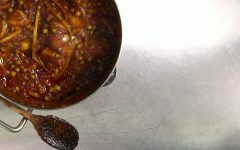 Cover your slow cooker and cook for 4 to 5 hours on high temperature, or 6 to 8 hours on low temperature. Go to work, take a nap, watch for your favourite tv show, do your laundry, etc. 1 hour before the timer is up, add large onions, pushing them into the soup. Close your slow cooker and leave it alone. 30 minutes before you finish cooking add half the parsley and spring onions. Reserve the rest for garnishing. Slow cooker done? Remove cinnamon sticks and lemongrass before serving. Also, give your soup a good stir especially if you’re dishing them out into individual bowls so you will get a nice mix of soup, spices and vegetables. 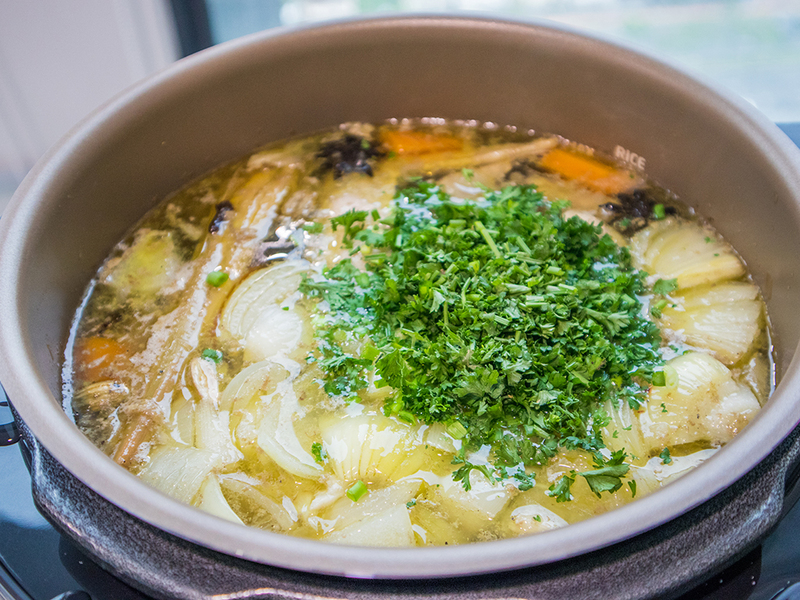 Serve your slow cooker chicken soup with fresh parsley and spring onions for garnishing, and sprinkle a generous dose of fried shallots. The soup is great paired with rice, nasi impit, or crusty bread for a comforting meal! 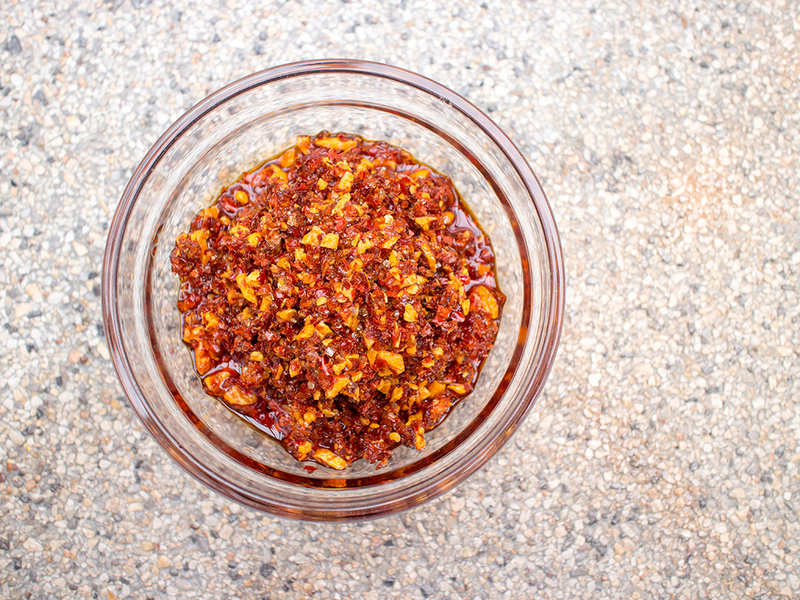 For some heat, we recommend having some sambal kicap to go along with it! If you’re out, add brown onions at step 7 along with the potatoes and carrots. They’ll be extra mushy, but still fine. 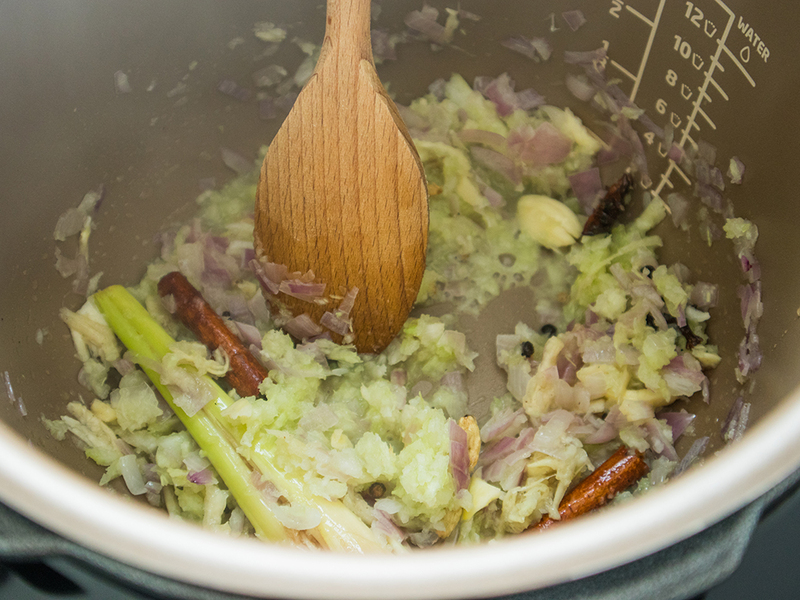 However, if you’re out when your slow cooker completes its cooking, add parsley and spring onions when you get back and let it cook for an additional 15 minutes. 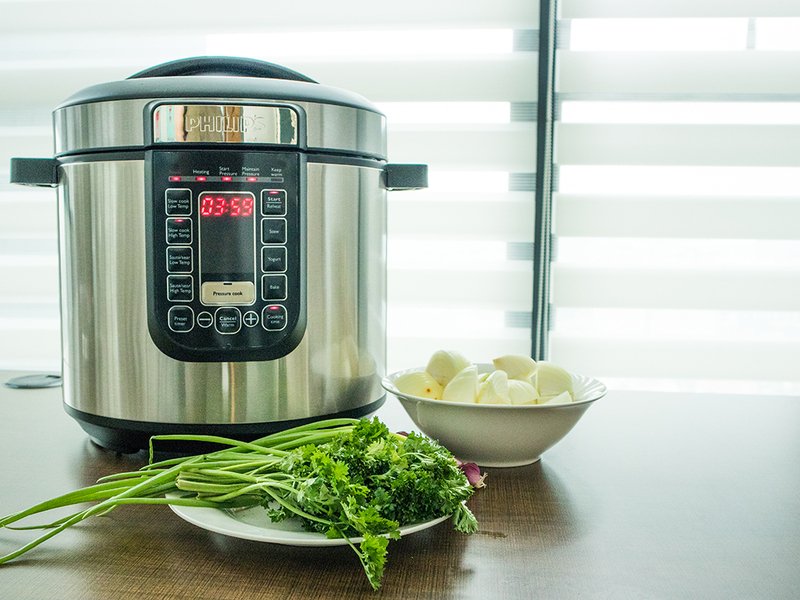 Optionally, you can also set your slow cooker short of 30 minutes the first time around and add the additional time along with the parsley and spring onions when you get back. 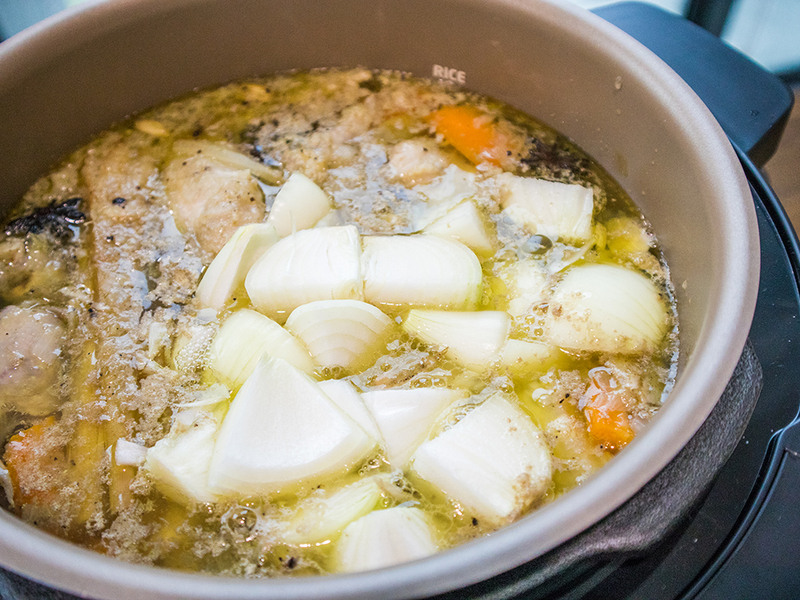 Are you ready to dig into some slow cooker chicken soup goodness? We are! 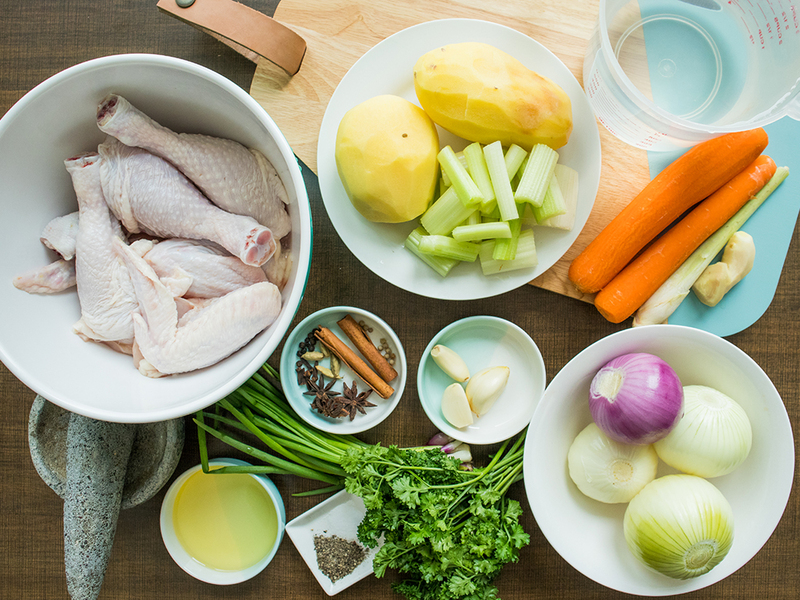 The aroma of chicken soup cooking in your slow cooker all day long will definitely leave your tummy rumbling and your mouth watering. 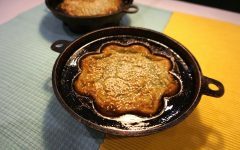 We were pretty pleased with the result as Philips All-in-One Cooker made the process so simple and absolutely fuss free. Try it yourself and you’re going to start wondering why you never got a slow cooker earlier! 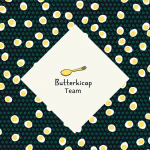 Hashtag us with your slow cooker results using #butterkicap, and let us know what other recipes you’d like us to try and slow cook! No slow cooker? No worries. 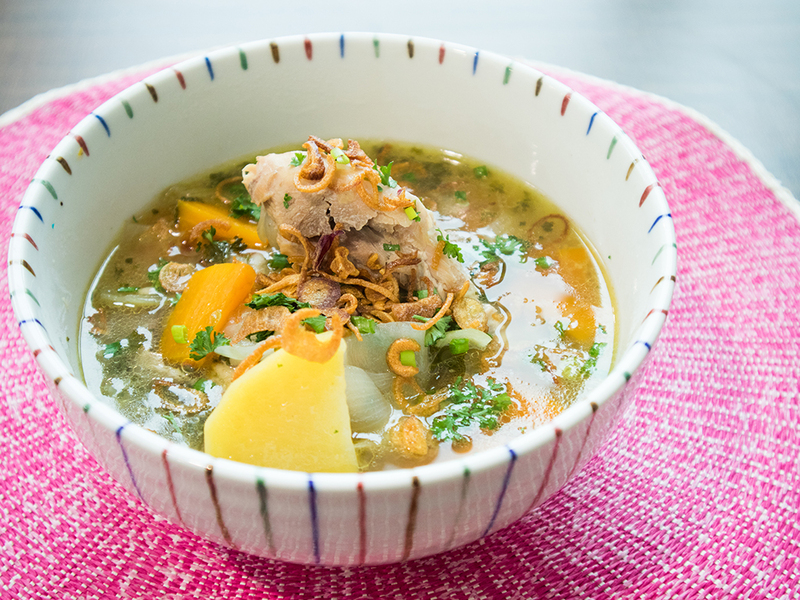 Check out our Chicken Soup Recipe: A Malaysian Take on a Wholesome, Hearty and Comforting Soup.